Desperate for cash to pay for their wedding, Pennsylvania couple April Cater and Joseph Russell allegedly stripped more than $7,000 worth of copper from utility poles and sold it to a salvage company. We all know how expensive weddings can get, but there are better solutions than turning to theft. So if you're facing a similar dilemma, but would prefer to stay out of jail, we've got some tips for cutting down wedding costs. Save from the start by shopping smart for engagement rings. If the bride's heart is set on a diamond, we have some excellent advice here. But if she's flexible, consider a less-pricey gem such as an emerald or sapphire. When choosing a setting, white gold has the same look as platinum at a lower cost, while traditional yellow gold is usually the least expensive. 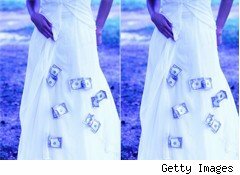 Another big expense is the wedding dress, but again, this is an easy area to find serious savings. In addition to the great advice in this article, brides can also save big by browsing eBay, Craigslist, and consignment or second-hand shops for deals; borrowing a gown from a friend or relative; or hiring a tailor to make their dream dress. Remember, the dress will only be worn once for a few hours -- you don't want to be paying for it for the next few years. Reception venues don't have to be fancy to make an impact. Some of the most memorable weddings I've been to have been in backyards, public gardens, a church fellowship hall, even on the grounds of the grade school where the bride's father taught. Think outside the ballroom for low-cost or free alternatives -- do any friends or relatives have a large enough home to host the party? How about access to another large space? Is anyone a member of a neighborhood pool with space for a party? Keep in mind that using a venue that's not already equipped for a wedding may require extra coordination. You may need to bring in a tent, extra chairs and tables (borrow, borrow, borrow -- they don't have to match! ), or dinnerware (borrow or go with disposables). But saving thousands on venue rental fees will be worth it! Sticking to hors d'oeuvres, choosing chicken over steak, or opting for beer and wine over a full bar are common (and sensible) tips for saving on refreshments, but really, the sky's the limit for creative couples. A morning ceremony followed by a champagne brunch is elegant but inexpensive, as is afternoon high tea or a late evening dessert fete. Serving offbeat foods is another way to cut costs without skimping on style, especially if the chosen cuisine has special significance for the couple -- think beer and brats for sports lovers, a wine-and-cheese tasting for foodies, or dim sum for world travelers. One couple I know opted for a pizza buffet in honor of the pizza place where they had their first date, while another catered their own reception with appetizers and wine from Costco. Instead of cutting out hard liquor altogether, one of my favorite cost-conscious tips is to serve just one fun signature cocktail. It's a festive option that will keep bar costs manageable. Savvy brides already know to opt for local, seasonal blooms to keep flower costs down, but cut back even more by nixing the floral centerpieces in favor of inexpensive candles? Pillar candles in every color imaginable can be found for a few dollars each at discount or craft stores. For a more casual event, hit the dollar store for toys for the table instead. Guests of all ages will go nuts over Slinkys, Silly Putty, small puzzles, and other fun fare. They can even do double-duty as party favors. Speaking of favors, feel free to skip them altogether -- no matter what Auntie Edna says, it's perfectly OK etiquette-wise. Here's another place to lean on friends and family. Nearly everyone knows someone who fancies themselves a budding photographer or filmmaker, and now that even phones can shoot HD video, there's no need to go pro for specialty equipment. Consider assigning a few shutterbug friends to capture key moments so you have plenty of shots to choose from (and back-up if something goes wrong!) and assigning others to take candid photos and videos throughout. Low-cost pros and talented amateurs can also be found through area art schools. Ask the school to refer its top students and graduates. Local newspapers are another fantastic source for photographers with lots of experience, but who often charge far less than those who do weddings as a career. Any bride who's paged longingly through Martha Stewart Weddings is going to hate this advice. Yes, I know those cakes are beyond gorgeous, and sure, they'd probably get a lot of oohs and aahs on your wedding day. But they also cost a small fortune, and even worse (at least for this sweets-loving writer), they don't even taste good! Go with a cake if you must, but keep it simple and small. Place it on a high cake stand surrounded by candles and it won't even look skimpy. Cut the small cake for photos, then serve guests from a sheet cake. No one will notice, especially if the cake is tasty. An alternative is to skip the cake completely and choose a favorite dessert instead. My sister dished out key lime pie at her wedding. Robyn Gearey suggests that if all else fails, just elope. At least you won't be spending your honeymoon in jail. The Motley Fool owns shares of Costco. Motley Fool newsletter services have recommended buying shares of Costco and eBay.